Do you know the answer? Life presents an overwhelming amount of unanswered questions on a daily basis. Searching for elusive answers takes us along various paths of discovery. Jeremy Camp has found his path through inspirational rock music. Taught to play guitar at a young age by his father, Jeremy's developed interests in music strongly influenced by the talents of U2, Delirious?, and Jars of Clay among others. 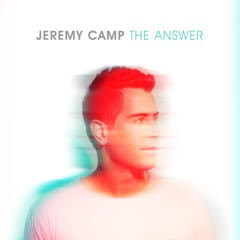 Find The Answer in new music from Jeremy Camp. Thank you to the team for Jeremy Camp and FlyBy Promotions for the courtesy of providing a promotional media review copy for #TheAnswer editorial content purposes. Jeremy Camp's 9 albums to date have earned 5 RIAA Gold Awards and 1 RIAA Platinum Award, sold over 4.5 million units, achieved Billboard #2 Artist of the Decade, secured a GRAMMY® nomination, received 3 American Music Award nominations, won 5 Dove Awards, scored 4 ASCAP 'Songwriter of the Year' Awards, in addition to 37 No. 1 radio hits across all formats. Find The Answer in inspirational new music from Jeremy Camp.